Attention-grabbing digital signage in Beef O’Brady’s sports bar in the student center of the University of South Florida, with eight satellite sources available over 42-, 50-, and 62-inch Samsung plasma displays. With the launch of this new service offering, Joyce Vogt has been promoted to digital media business development manager, AVI-SPL. Upon entering the four-story Marshall Center, students are greeted by a multimedia LED 4- x 46-foot billboard (custom made by Multimedia LED) in the atrium. I recently asked Vogt to explain AVI-SPL’s further involvement in the digital signage arena. Digital Signage Magazine: AVI-SPL is mainly an integrator for installed AV — boardroom, classrooms, etc. As a traditional systems integrator, how do you see the digital signage market evolving? Specifically, is AVI-SPL just marketing digital signage solutions to existing customers, or getting new customers, in non-InfoComm type sectors, like retail? Joyce Vogt: At AVI-SPL, we believe that most clients have a need or application that can be addressed with digital signage. Whether it be a hospital that wants to facilitate more efficient patient care, a retailer that wants to provide their manufacturing partners a more effective outlet for product communication, or a school interested in providing more timely communication to parents and staff, digital signage represents an opportunity for all businesses in all sectors. We see the potential for tremendous growth in digital signage over the next several years, along with the trend toward cloud computing. These two fundamental shifts, working together, make for an interesting and compelling product offering: Digital Media as a Service. It is anticipated that this offering will facilitate a rapid adoption of digital signage, in a budget-friendly fashion. As a result, we are proactively approaching both current clients and new prospects with digital signage solutions, both on-premise and cloud-based, that are designed to address a specific business need. We believe that digital signage has many business applications, but that the ROI information hasn’t been readily available. We feel that the timing is right to pursue new positioning strategies and introduce our clients to digital signage applications. How do AVI-SPL’s clients respond when you ask them, as part of your “DMaaS solution,” to put their data into the “cloud”? AVI-SPL is operating an on-premise signage solution from our Network Operations Center (NOC) as a service, to be shared by many clients. By offering up a single, secure, multi-tenant server for many clients to share, we are drastically reducing costs, decreasing barriers that exist to signage adoption, and providing our clients with an immediate, low-risk solution that allows them to quickly and cost-effectively validate ROI. In a cloud computing model, the location of the server and software really doesn’t matter much to the client. They just need access to the technology through an internet connection to develop, manage, and distribute content to their digital signs. With the launch of AVI-SPL’s new digital signage content management offering, Joyce Vogt has been promoted to digital media business development manager, AVI-SPL. If a client also has a requirement for informational signage, specifically data feeds that are considered too confidential to allow off-premise, it is possible to design the content through our DMaaS solution to reference these data sets inside of the clients private network environment, essentially populating these data sets on-the-fly as the content is being delivered to screen. With this configuration, all confidential data sources can remain local while the non-sensitive content management remains in the cloud. This is an extremely valuable and unique feature that will further support the idea of positioning the content development, management, and delivery infrastructure in the cloud for distributed access. How far is AVI-SPL getting into content production? Many don’t know this, but AVI-SPL has a content production studio in our Tampa headquarters. The content produced there is typically developed for major events that we’re managing for our clients. It is a natural progression for us to leverage this capability by offering digital signage content production, management, and delivery services to our clients. We will absolutely consider partnering or hiring if we feel it necessary, but it is our intent to expand on the solid content production foundation that exists within the organization already. Do you foresee this application being used for areas other than digital signage? We see applications for DMaaS in all vertical sectors, including corporate, education, healthcare, retail, manufacturing, and the list goes on. It is our anticipation that once our clients truly understand both the cost benefits of the cloud model and the potential business efficiencies that can be gained through digital signage, we’ll be keeping our integration teams busier than ever, implementing digital signage endpoints. As far as future applications, there is great opportunity to offer our clients additional services around this virtually managed network. Things like content services, which was mentioned earlier, reporting and analytics, the application of interactive touch, ad sales, and distribution, and then, eventually, integration services once the network requirements dictate onpremise implementation. We expect that we’ll be able to on-board our clients cost-effectively and in a phased fashion, allowing them the ability to gradually implement signage strategies without the significant cap-ex and op-ex resources required for an on-premise solution. Challenge: Despite major renovations to accommodate growth, the University of South Florida (USF) faced an immediate need for the construction of a new student union. With plans for a formal dedication in April 2009, the new Marshall Student Center would need cutting-edge technologies for a versatile range of activities, including formal fundraising events and student government meetings. Solution: AVI-SPL was the systems integrator charged with the solution. Upon entering the four-story Marshall Center, you’re greeted by a multimedia LED 4- x 46-foot billboard (custom made by Multimedia LED) in the atrium, which creates a stunning and creative display for upcoming events and advertising. The Visix digital signage system provides the content management software for displaying messaging throughout the facility, including near the elevators of each floor (public area displays are a 32–46-inch NEC LCD panels, with one large 63-inch Samsung Plasma). Attention-grabbing AV components also distinguish the Beef O’Brady’s sports bar in the student center, with eight satellite sources available over 42-, 50-, and 62-inch Samsung plasma displays. Patrons can also tune into audio sources via their “Sound Dog” wireless tabletop top speaker system. 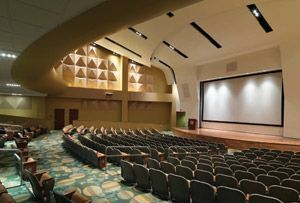 The large-scale presentation spaces of the USF Marshall Center highlight flexible and user-friendly audiovisual systems. With seating for approximately 1100 guests, the three-way divisible ballroom features technology that can work independently and simultaneously, or as one large space. A wireless control system accommodates the high performance audio system, electric projection screens (Da-Lite) and 1080p projectors. The Marshall Center’s 700-seat auditorium also features the power of 1080p projection, with more than 20 individual speaker enclosures mounted all around the room. Main delay and fill speakers are strategically placed around the balcony and 14- x 26-foot projection screen. The projector in the auditorium is a single Christie model HD10K-M, 8000 lumens, 1080p native resolution. Additional projection and audio systems are featured in the tiered-style Senate Chambers, 10 small conference rooms, and four large conference rooms. For easy monitoring capabilities, all control systems are tied into USF’s network. The two projectors in the ballroom are projectiondesign model F32-1080p, 4500 lumens, 1080p native resolution.